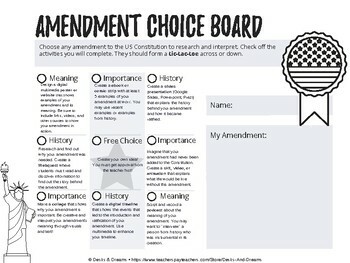 Students will choose 3 different activities from a tic-tac-toe style choice board to delve into the meaning, history, and importance of one amendment to the United States Constitution! 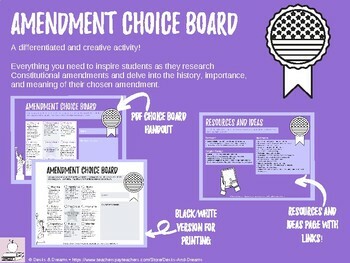 This activity is automatically differentiated and gives students choice in how they want to learn and which amendment they want to know more about. All of the activities are high-level and require students to research and apply their knowledge in creative ways. Many of the activities are digital. This choice board works best for students that have access to Chromebooks, laptops, or a computer lab. However, it can be modified for students without access to technology. 1 - Choice Board - Print (or post in online/in Google Classroom) the PDF handout and review the choices with students. Depending on their strengths and learning styles, there are various options that will appeal to different learners. 2- Choice Board (Black and White version) - Use this version for easy printing and copying. 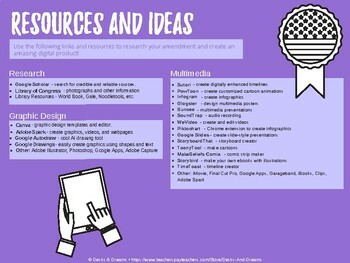 3 - Ideas & Resources page - This page contains links to a multitude of amazing resources that students can use to create their choice board projects. Links are provided for research, multimedia, and graphic design resources that are easily accessible and student-friendly. Students can even use these ideas to come up with their own choice board projects. The possibilities are endless! This works great as an ending to a unit on the Constitution, American government, Civics, or as a unit project. I hope your students have fun and show their creativity while discovering the amendments, a high-interest topic!